As we age, we experience changes in the structures of the eye. Some changes, like the waning of functional abilities, are considered within the normal limits, while other symptoms may signal the onset of disease processes. Those who have reached 40 years of age typically begin to notice changes to their visual acuity, or sharpness of vision. This common age-related condition, known as presbyopia, makes it difficult to focus and discern fine detail at close distances. Correctable with glasses or contact lenses, presbyopia will continue to progress slowly over time until around age 60. When we are young, the lens of the eye is soft and flexible. Tiny muscles inside the eye can easily reshape the lens to focus on both near and distant objects. With aging, the lens begins to harden and muscle fibers are affected, resulting in difficulty in reading small print or seeing nearby objects clearly. While there is no current cure or known prevention strategies for presbyopia, with corrective lenses most individuals should be able to enjoy clear and comfortable vision. The vitreous humor, a clear gel-like substance that fills the space between the lens and the retina, gives the eyes their shape and form. Millions of fine fibers in the vitreous humor are attached to the surface of the retina. As the vitreous shrinks and becomes more liquid with aging, fibers may pull away from the surface of the retina. This can cause tiny specks of tissue or debris to remain in the vitreous gel. Known as floaters, these tiny particles appear as dots, cobwebs or strings. What one is actually seeing is the shadow of the debris, as light is cast on the retina. In most cases, occasional spots or floaters are normal. They can be annoying, but many individuals become accustomed to them, and they generally don’t negatively affect vision. The need for brighter light, while reading or performing close-up tasks. Decreased contrast sensitivity, or the ability to detect low contrast images, especially with low light, fog or glare situations. This can result in difficulty driving at night, or eyes may tire more easily while working on the computer or watching TV. As it becomes harder for the eyes to focus, most experience difficulty reading without corrective lenses. Changes in color perception. Some find it hard to distinguish between shades, such as blue and green. Dry, irritated eyes resulting from reduced tear production. Particularly troublesome for menopausal women, adequate tears are necessary to keep eyes healthy and vision clear. Sudden development of floaters, flashes of light, or an appearance of a curtain over the field of vision could indicate a retinal tear or detachment, and should be treated as soon as possible to avoid vision loss. Low contrast sensitivity can result in decreased depth perception, potentially resulting in missteps and falls. Reduced contrast sensitivity can also be a symptom of certain eye conditions, such as cataracts, glaucoma or diabetic retinopathy. Chronic conditions, such as diabetes and high blood pressure, can damage tiny blood vessels of the retina or cause permanent vision loss. As fluctuating vision can be a sign of undiagnosed health conditions, a visit to an eyecare specialist is in order. Loss of peripheral, or side vision can be a sign of glaucoma. Symptomless until vision damage is done, glaucoma damages the optic nerve, preventing the transmission of visual images to the brain. Distorted images or a blind spot in the middle of one’s vision field can be signs of age-related macular degeneration (AMD), the leading cause of vision loss among those aged 50 and older. AMD damages the macula, located in the center of the retina, that is necessary for sharp central vision. Central vision loss can affect the ability to read, drive, watch TV or recognize faces. Strong risk factors for AMD include aging, smoking, genetic factors, family history, sunlight exposure, and hypertension. The impact of vision changes can have a significant effect on quality of life. It’s important to recognize the difference between reduced visual function in healthy individuals and specific eye related diseases. Yearly eye exams can mean early diagnosis and treatment of eye diseases, and preservation of vision health. Research has linked specific nutrients, that include lutein, zeaxanthin, zinc, and vitamins C and E, to reducing the risk of developing cataracts and macular degeneration. In nature, lutein and zeaxanthin appear to absorb excess light energy to protect plants from too much sunlight, especially high energy rays called blue light. A number of studies have shown that lutein and zeaxanthin, antioxidants found in high concentration in the macula, may protect against light induced oxidative damage that could lead to AMD. Highly concentrated in the eye, zinc plays a vital role in bringing vitamin A to the retina to produce melanin, a protective eye pigment. Impaired vision, such as poor night vision and cataracts have been linked to zinc deficiency. Antioxidants fight oxidative damage and support general eye health. Natural antioxidants that include vitamins C and E and betacarotene have been shown to be of benefit in the prevention of AMD. Hyaluronic acid (HA) is associated with balanced eye moisture. Oxidative stress can cause HA levels to decrease as we age. Omega-3 fatty acids are essential for healthy vision, and may also improve circulation, strengthen the integrity of the blood vessels, and naturally support healthy inflammatory processes. Several types of collagen are found in the eye. 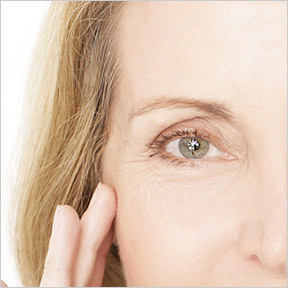 As collagen tends to degrade with aging, nutritional support for collagen heath may be helpful. Vitamin D3 supports vision health, as well as cardiovascular, immune, skeletal and cognitive health. Eye Moisture Support by Douglas Laboratories®: This unique formula provides critical support for eye and retinal health, healthy tear production, and ocular moisture retention. Ingredients include QUELL Fish Oil®, vitamins and antioxidants. Gluten, wheat, soy, yeast and artificial ingredient free, Non-GMO formulation. 20/20 Eye Formula by Nutritional Frontiers: Specifically formulated for individuals with poor night vision, cataracts, AMD, or allergies that affect the eyes, this product provides antioxidants lutein, zeaxanthin, ALA, and astaxanthin, as well as zinc and vitamins A, C, and E for support and protection of eye health and function. Vision Protect™ by LuxVite Naturals: Ophthalmologist formulated with selected vitamins and antioxidants, this product is designed to promote eye health and provide macular support. Laboratory tested for quality and purity. Clinical Nutrients™ Eye Formula by Integrative Therapeutics®: This product is designed to provide valuable nutrients that support proper eye health and function. Ingredients include vitamins, minerals, antioxidants and anti-inflammatories. Gluten, wheat, yeast, dairy, and artificial ingredient free formulation. MacuGuard® Ocular Support by Life Extension: This innovative formula provides comprehensive ocular nutrition to help protect macular health from oxidative stress and light-induced damage. Non-GMO formulation. Macular Support Formula by Pure Encapsulations®: This comprehensive hypoallergenic formulation provides a blend of powerful antioxidants and botanicals designed to support, maintain, and improve macular health. Gluten and soy free, Non-GMO vegetarian formulation. This entry was posted in Home and tagged 20/20 Eye Formula by Nutritional Frontiers, Age Related Vision Changes, Clinical Nutrients™ Eye Formula by Integrative Therapeutics, Eye Moisture Support by Douglas Laboratories, MacuGuard® Ocular Support by Life Extension, Macular Support Formula by Pure Encapsulations, Vision Protect™ by LuxVite Naturals. Bookmark the permalink.